A practical manual for recreating the Rites and Mysteries of Demeter and Persephone, an ancient Earth-based religion that celebrates not only the Great Mother Goddess and Her Daughter, but a respect for life, for the Earth, and for the divinity of the soul. Each celebration or rite is complete and presented in a clear and practical way. Includes chants, sacred prayers, and recipes for sacred food, and practical, as well as, historical, information. Color photos. llustrated. Bibliography. Index. Jennifer Reif is the author of four published books: Mysteries of Demeter, Rebirth of the Pagan Way, Morgan Le Fay's Books of Spells and Wiccan Rites, Aphrodite's Riddle: A Novel of Goddess Worship in Ancient Greece and she co-authored The Magical Crone Celebrating the Wisdom of Later Life. She has also published an album of original songs, Mysteries of Earth). An artist, poet and musician, Reif has studied the relationships between nature, ancient cultures and their mythologies for decades. She taught classes in cross-cultural mythology in the Los Angeles area for many years, developing a special interest in the Divine Feminine and Greek mythology. 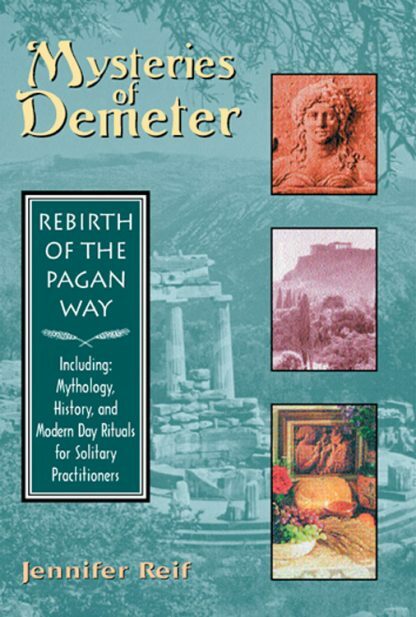 She spent ten years researching and writing the ground breaking nonfiction work Mysteries of Demeter: Rebirth of the Pagan Way.